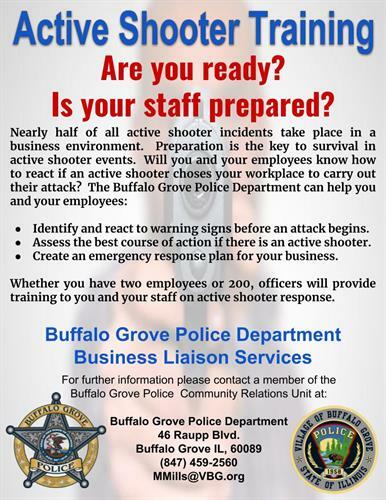 The Buffalo Grove Police Department works with local businesses and organizations to make the community a safe and secure place to live and work. The police department provides a number of services to local businesses and organizations such as conducting physical security assessments for your organization, mediating disputes, consulting on active shooter response policies and training, and providing traffic assistance for large events. The police department also works with area businesses and organizations on community events such as Picnic with the Police, Bowl with a Cop, National Night Out and Shop with a Cop to name just a few. Members of the Community Relations Unit are available to provide presentations on topics such as scam prevention, being a good witness, identity theft, and how to respond to an active shooter.